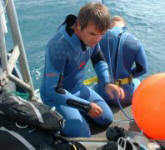 Basically, we design, build, operate and hire out highly sophisticated survey craft and underwater equipment. When you charter one of our vessels you don't just get a boat, you get a purpose-built survey vessel fitted with a full range of electronics, hydraulics, power supplies and computers. You also get a mobile lab/workshop on a Mercedes Unimog, all-terrain truck. We can deliver and self-launch our 8m survey RIB, one 12m barge and two diving tenders using this single vehicle. We also deliver our 12m survey vessel by road to be launched by crane or marina travel lift. We are well practised in data collection for most forms of survey work including: bathymetry, side scan, geophysics, acoustic seabed classification, magnetometer, ADCP, dye tracing, drogue tracking, water sampling, beam trawling, benthic sampling, seabed imaging, drop video, towed video, diver surveys and ROV work. We have also provided equipment and management for shore-end cable landings and assisted in cable surveys, inspections and burial, including development of a cable burial tool. Since 1990 Aquatech has evolved with the inshore and coastal survey market and produced a series of innovations in survey boat and equipment design. By constantly upgrading to meet the ever changing market we can always offer new and cutting-edge solutions. To keep everything running safely and smoothly we only provide highly capable, qualified crew with many years' experience on the water in small boats. We have designed, engineered and manufactured most of our equipment so we always know how to keep it running in good order. We now offer a design and fabricate service for survey equipment including: sediment grabs, beam trawls, water samplers, underwater housings, towfish and remote controlled vessels.